This recipe converted me— I never used to really like nuts. But rum, sugar & spice– a delicious combination. Perfect for cocktail/holiday parties. Quick & easy. 1. Adjust an over rack to the middle position and heat the oven to 350 degrees. Line a rimmed sheet w. parchment paper and spread pecans on it in an even layer. Toast for 4 mins, rotate pan, and continue to toast until fragrant and the color deepens slightly, about 4 mins longer. Transfer the baking sheet with the nuts to a wire rack. 2. For the spice mix: while the nuts are toasting, stir the sugar, salt, cinnamon, cloves, and allspice together in a medium bowl; set aside. 3. For the glaze: bring the rum, vanilla, brown sugar, and butter to a boil in a medium saucepan over medium-high heat, whisking constantly. Stir in the toasted pecans and cook, stirring constantly with a wooden spoon, until the nuts are shiny and almost all the liquid has evaporated, about 1-1/2 minutes (mine took less than this). 4. 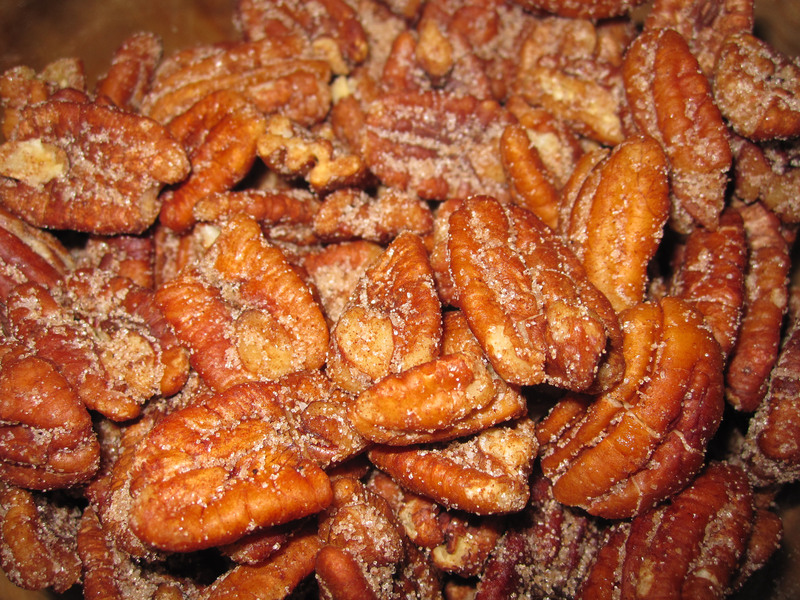 Transfer the glazed pecans to the bowl with the spice mix; toss well to coat. Return the glazed and spiced pecans to the parchment-lined baking sheet to cool. These were delicious. I’m just glad someone reminded Tessa to take a picture of them for the blog.